I’m writing this on a slow train from Gemas to Kota Bharu, Malaysia. We’re taking the long and non-express train so we can make our way through the oldest jungle in the world. 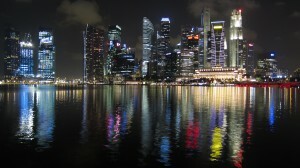 We’ve been using this down time to put our pictures together from Singapore (see below). The second busiest port in the world (it only recently lost it’s first place title), Singapore is the only country in Southeast Asia that continued to grow during the recession. Ninety percent of the people own homes, the cheapest of which is about $150k US, even though many working people make $650 US a month. Low interest government loans help make that possible. The brothers and sisters of the Seafarers Union here gave us a warm welcome, helped us find a place to stay and invited us to a member appreciation dinner. In celebration of our recent honeymoon, we were invited to dance for everyone in attendance. We complied. There are no pictures. In addition to being a busy port, it’s a major tourist destination, which explains the multiple mega-malls that blast AC. We could pretty easily walk 5 or 6 city blocks without having to go outside even to cross the street – eat your heart out Mall of America. Singapore is famous for it’s Hawker markets which are essentially food courts with much tastier food. We had a lot of fun in the city/country that locals sometimes refer to as “the company” because of it’s profit driven outlook on decision-making. Between it’s mega-malls and food courts, it’s not hard to think of it as a uber mega-mall. 1. The Singapore Zoo and Night Safari – I didn’t think I’d like them, but they were quite impressive. The animals seemed happy and active (I suspect they may add caffeine to their water). I even captured a baboon doing a back-flip. Sasha has decided she’d like to become an owner of what is essentially a miniature leapard. 2. Melting Pot – The seemingly seamless mixing of cultures and religion. People and cultures from all over Southeast Asia and the world live and work together. It shows up in the food, the dress (hajib, sari and mini-skirt), variety of religious sites and school kids walking home together. 3. Local Union – Our night at member appreciation dinner with Seafarers isn’t one we’ll soon forget. Their hospitality was above and beyond. 4. Hawker markets – For a country that takes its food very seriously, competition is fierce and Hawker markets are a snake pit of deliciousness representing the best of Asian fusion. 5. Cable car ride and the Port of Singapore – The cable car ride to the neighboring island of Sentosa is 360 degrees of breathtaking views. About 270 degrees of that view is filled with the Port of Singapore or one of the thousands of cargo ships anchored off the coast. 6. Original Singapore Sling – At the uppity colonial Raffles Hotel where we had to use the back entrance to get in since we weren’t guests, we paid our respects to the Long Bar, the home of Original Singapore Sling. The bar serves up over a thousand of these pricey beverages every day. 1. “Spare parts” – We’ve been on overdrive tasting new foods. Most are great, some exceptional, but we’ve only had one dud so far. Our new friend Gwee, from the Seafarers Union, took us to lunch and cherry picked a meal for us at the Hawker market – famous hokkien chicken rice and 4 different fruit juices. It was good enough to make the highlights list. However, he also ordered what the sign called “chicken organs” or what he called “spare parts”. Chicken liver and lungs in a nice sauce. Bitter, pasty, we couldn’t hack it. But we didn’t feel so bad when our host didn’t have a bite at all. PS if you ever wonder, “Where the heck are those guys” check out the map in the right column. We update it as often as we can. Click on the first photo to start a slide show. Thanks Karyn. Glad we can be of service. WOW! This is so fun to get your updates! I love it! And do you know that I use agar agar as a thickener instead of cornstarch. It is incredibly nutritious!! keep up the pictures and commentary!! Wow! That is so good to know about agar agar. Will remember it. As a jelly desert the flavor left it with the first chew or two. Then it just became an exercise in texture. Love to you and C.
Great photos! I’ve transited through Singapore so many times but I have never stayed over to explore the city. Next time I definitely will. Have a great time in Khota Bharu! Interesting love reading your updates. Keep posting. I am having soooooo much fun keeping up with you guys. I look forward to seeing something every day. WOW what an adventure! Thanks Kim. And you have some great pictures yourself… amazing work on the house. What amazing before and after pictures. It looks so great! Hi I have just come across your site here due to the name lol it is amazing to find two people sharing not just my name but my love for travel and adventure unfortunatly I do not het away ss much as possible but I did manage to go climb mount kilimanjaro in africa and am planning on doing everest base camp next year. I look forward to reading more of your adventures on here and would love to know more about you please feel free to email me.